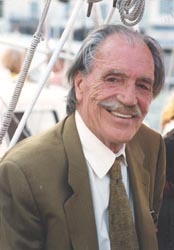 Renowned landscape architect, writer and educator Ian L. McHarg (1920-2001) was best known for introducing environmental concerns in landscape architecture. He was also instrumental in founding the original “Earth Week” in 1970. 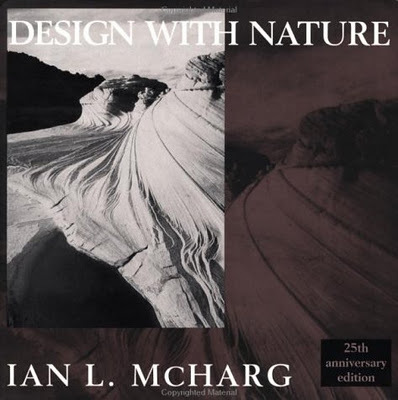 His 1969 book Design With Nature pioneered the concept of environmental planning. Design with Nature is widely considered one of the most important and influential works of its kind. 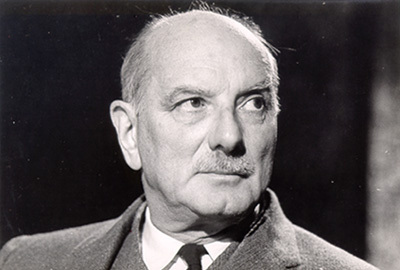 His premise is simple: “that the shaping of land for human use ought to be based on an understanding of natural process.” The ecological planning method developed by him to apply this theory was seized upon and used throughout the world. McHarg insisted we look at the many aspects of the entire system we are designing when building streets, structures, and cities; and instead of fighting against natural forces, design in harmony with them. He showed how to do this, with modern tools, analytic overlays, GIS mapping, and a fact-based approach. His philosophy was rooted in an ecological sensibility that accepted the interwoven worlds of the human and the natural, and sought to more fully and intelligently design human environments in concert with the conditions of setting, climate and environment. 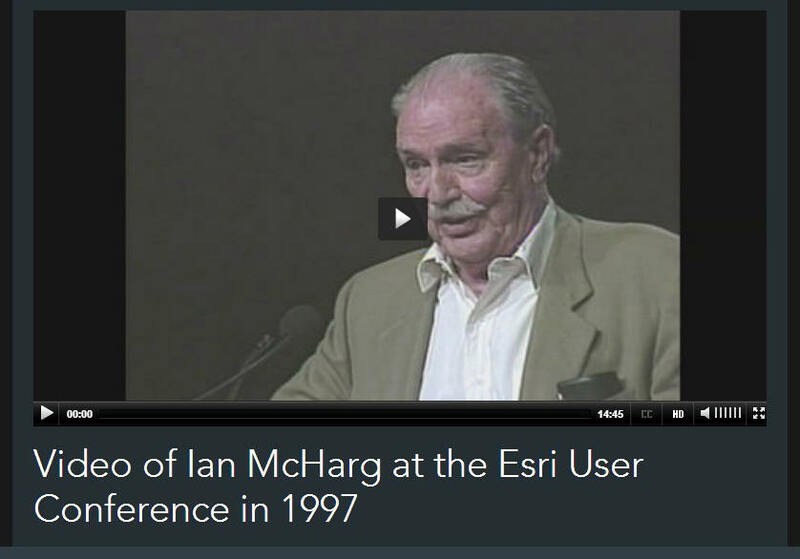 “For me, the great dream would be, if by the remaining years of this century…the nation and the world concluded there should be a global and national ecological inventory…all of us address ourself to greening, healing and restoring the earth,” stated Ian McHarg in his acceptance speech when he received the President’s Award at the 1997 Esri User Conference. “To understand where we are heading in BC, we need to understand where we have come from. Historical context is important,” states Kim Stephens, Executive Director with the Partnership for Water Sustainability in British Columbia. 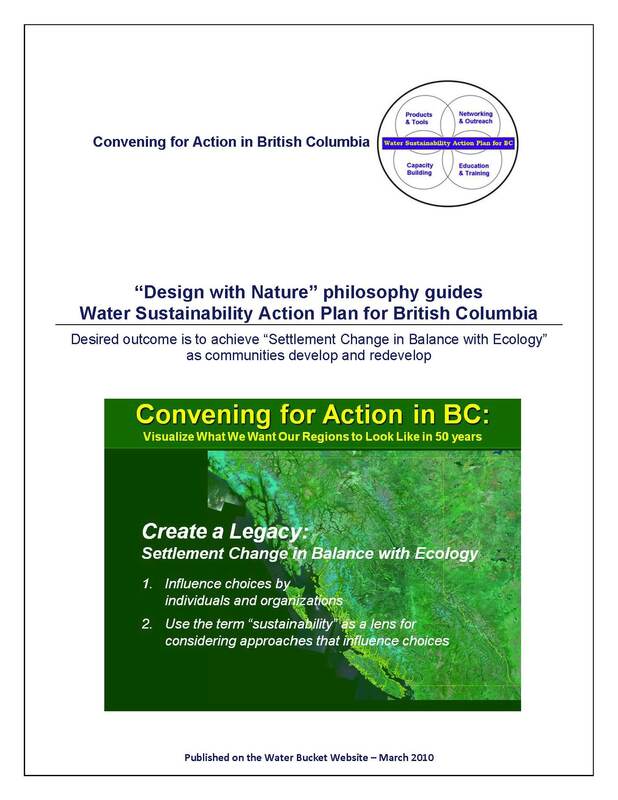 The ‘design with nature’ philosophy has become an integral and essential part of the green infrastructure, sustainable rainwater management and water sustainability branding in British Columbia. So, I commend Design with Nature to your sympathetic consideration. The title contains a gradient of meaning. It can be interpreted as simply descriptive of a planning method, deferential to places and peoples, it can invoke the Grand Design, it can emphasize the conjunction with and, finally it can be read as an imperative.DESIGN WITH NATURE! “We find that people intuitively understand what designing with nature means. It is non-threatening. Minds open. The concept provides a starting point for having conversations about living water smart, building greener communities and adapting to a changing climate. Perhaps this is what Ian McHarg had in mind when he wrote about the ‘gradient of meaning’. Suffice to say, the phrase Design with Natureworks, it really does,” concludes Kim Stephens.